Early morning bunny chores found all of Crystal's bunnies tumbled out of the nest. I moved her with the bunnies to a bigger cage and fixed the box so that they can go in and out. One tort's eyes are opening but they're all still snuggling together in the box. Mom seemed very proud of the new situation as the bunnies wobbled around her! Dad is bunny wrangling tomorrow, so he got lessons with the rabbits. They are very calm and don't seem to mind new people, especially if food is involved! A few days before kindling the mothers are sometimes a little nervous of someone new. So I try to be here myself during that time. But generally they are quite placid. I remember once when I had chickens I had a 'free' chick that grew up to be so nervous that he went wild every time I came into the henhouse. The rest of the flock panicked because he did. That rooster didn't stay. An easily frightened rabbit would affect the herd in a similar fashion, I think, and I wouldn't keep a rabbit that wasn't calm. Spent a few hours at the antique shop yesterday morning, working on the computer and visiting with the terrific people there. The morning was warm and sunny, but the minute I got home clouds rolled in and the thunder started rumbling. I capped strawberries standing at my kitchen window and watching the rain on the pond. There's something very satisfying about 'putting food by' and I like the think about strawberries in the freezer, waiting to enrich our winter meals. Between storms I cleaned in the bunny house, getting up hay and droppings from the floor and trays. I have a wedding to attend tomorrow in Northern Virginia so I want to leave things tidy for Dad and the bunnies. After that another rain came in so I went upstairs to curl up on the bed with sulky Lily. She's still very unhappy with her haircut! I also washed the Cormo skein I did for Alyssa in New Castle. She sent 3 ounces for me to try and I love the way it spins up. Soft, with lots of loft. 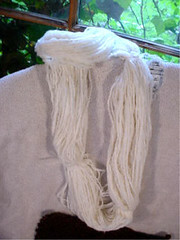 The skein is still wet so I can't send it back yet; probably it can go on Monday. I'm going to hate letting it go! 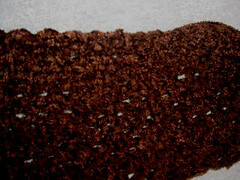 Last night I started a crocheted poncho, to have something to carry along for my little trip north. 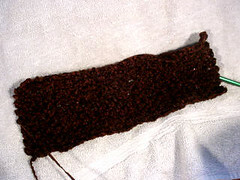 I'm using a commercially dyed nylon chenille in dark brown. it's hard to get a good picture of the stitch pattern; I'm using the same design I did for the green poncho, with some modifications I thought of after the first one was done! 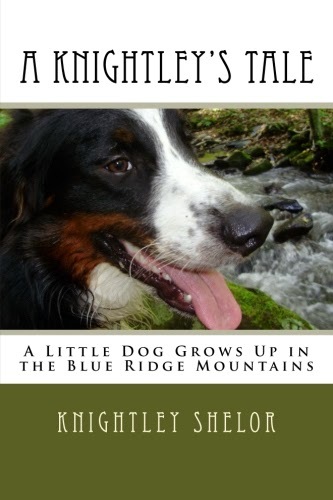 A sudden roar of thunder in the night surprised Lily and she woke me with a woof of mild alarm. I dashed down and unplugged the computer; can't afford to lose that. It was nice to snuggle back down under the covers with Lily's chin on my ankle, while the rain battered the tin roof and lightning flashed in the windows. Loud cracks of thunder shook the house and I fell asleep to the rumble as the storm moved away into the distance. This morning it was raining, but now it looks like the sky might be clearing. Bunny chore time!